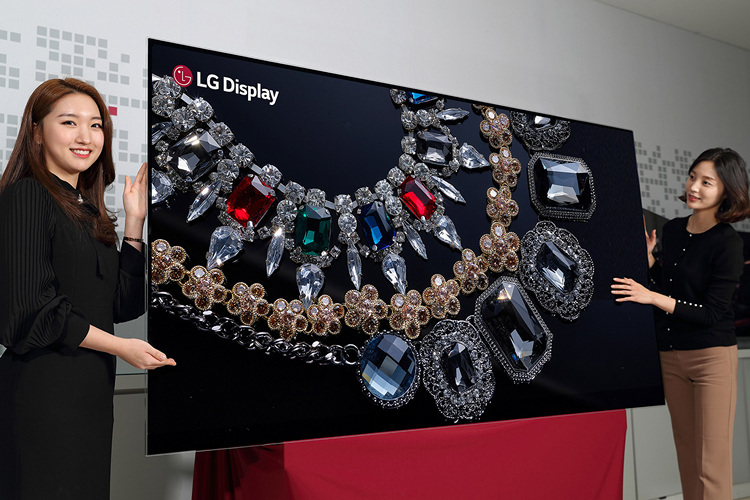 South Korean tech giant LG has officially unveiled an 88-inch 8K OLED display that the company claims is the world’s largest and highest-resolution OLED panel. The device comes with a resolution of 7680×4320 pixels – that’s 4-times as many pixels as in a 4K (3840×2160) display. The display will be officially unveiled at this month’s CES trade show in Las Vegas, Nevada, although LG is unlikely to announce pricing or launch date at the year-open technology show. LG has history with giant OLED panels, being the prime supplier for 77-inch units to Sony and Panasonic, and using them for its own high-end smart TV range. This particular 88-inch 8K panel is likely a technology showcase for the time being. Especially seeing as 4K panels becoming relatively more common in recent times, it will be interesting to see if LG will be able to drag 8K into the mainstream any time soon. “The successful development of the world’s first 8K OLED display is a milestone for the 8K era and underscores the exciting potential of OLED. OLED is clearly a next-generation technology leader and for this reason, LG Display is accelerating its research and development into OLED so that we can provide differentiated products to customers and markets”. LG is the world’s largest manufacturer of OLED panels, and has a great reputation for creating amazing televisions displays using this technology. However, the company has been having serious issues with its P-OLED displays in recent times, especially with the problems in the Google Pixel 2 XL and it’s own V30 and V30+ phones. So it will be interesting to gauge the industry reaction to this latest monstrous effort from the company. We’ll come back with more details on this 88-inch 8K display when it hits the show booths at CES 2018.